Harold Patterson MBE pictured with the cine camera which he used in 1953, as a 23 year-old camera club enthusiast, to film the footage of 'Our Town' which was shown at a 'Historic Lisburn Revisted' evening in the Assembly Rooms of the Irish Linen Centre on Tuesday 13th September. A UNIQUE film of the Queen put together by members of Lisburn Camera Club’s cine-section is to be shown on BBC Northern Ireland next week as part of the Diamond Jubilee celebrations. The film is so special because it was shot in colour and because the cameraman on the project - local businessman Harold Patterson - was able to get within feet of the Queen as she toured Northern Ireland just weeks after her coronation in 1953 - after getting special permission from the County Inspector. Harold and his late friends Sam Hopkins, Howard Walker, Bob Alexander and Ray Willis were dedicated members of the club and after Harold had followed the Queen around to get the material, they put the footage together into a film which gives a unique insight into the new monarch’s early weeks on the throne. Shots consist mainly of Lisburn - but also includes the Queen’s arrival at Aldergrove with the Duke of Edinburgh, Hillsborough, Balmoral showgrounds and Stormont. In 1994 David Dillon, who was a member of the club and worked for the BBC, put the material together with footage the Corporation had - and which was all black and white - with the resulting programme ‘A Royal Occasion’ attracting widespread acclaim. Harold, the last surviving member of the cine-section, was just 20 years old when he bought his first cine-camera in 1950. 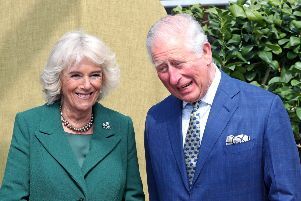 He was contacted recently by the BBC and was more than happy for the club’s footage to be used in the programme, which celebrates the Queen’s 60 years on the throne. This time it will not include the BBC’s material. And the film is so special footage will also feature on the BBC ‘s Countryfile programme which goes out across the country. Harold and some other interviewees were recently filmed for the programme in a special train from Lisburn to Antrim. Although the line is no longer used for scheduled services, it is still used by Translink for training and was the route the Royal couple used when they left Lisburn to go to Londonderry in 1953.